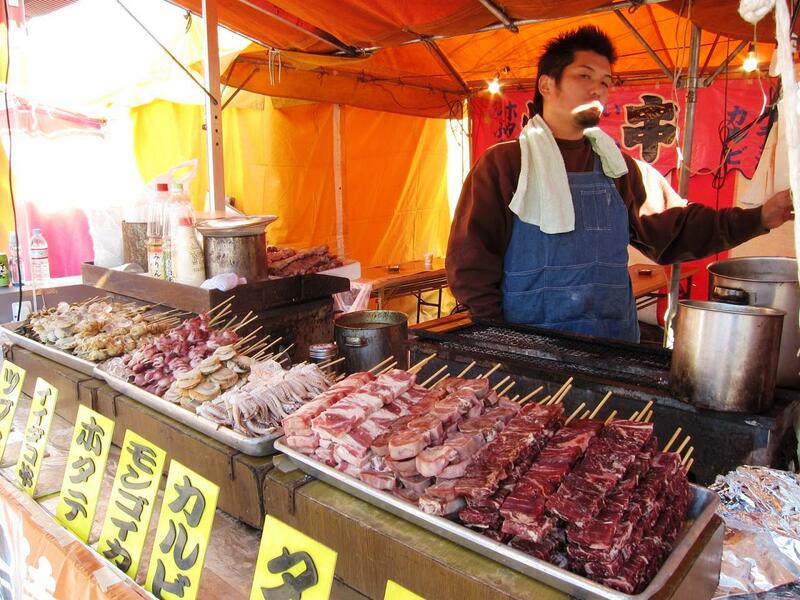 France and Japan are probably the top two contenders for the designation of the most food-obsessed nations. 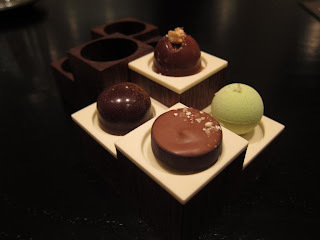 Western fine dining and high-end restaurant kitchens always seems rooted in French traditions while the artistic detailing that goes into a top-notch kaiseki meal is unsurpassed in the East. 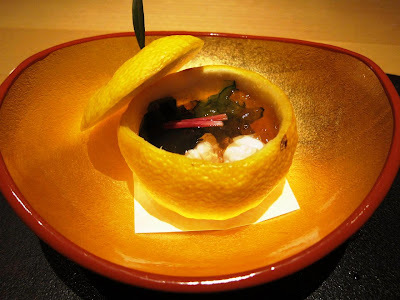 Which brings me to Benu, a recent entrant to San Francisco's dining scene where Chef Corey Lee successfully melds the two traditions together. 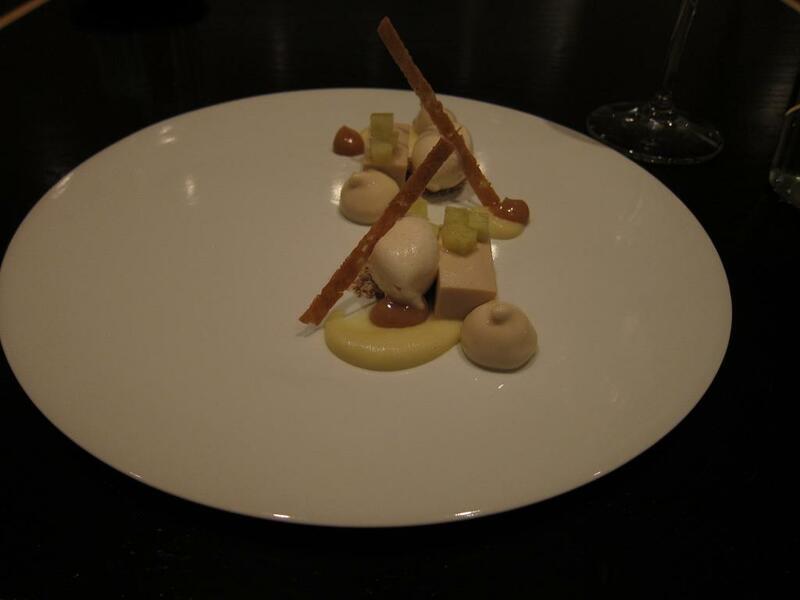 Corey Lee was chef de cuisine for several years at America's most revered restaurant, French Laundry. He now brings that same ethos but in a wholly original form to his new restaurant in town. His ancestry gives him an unique familiarity and insight into the best Asian traditions from which he frequently borrows. 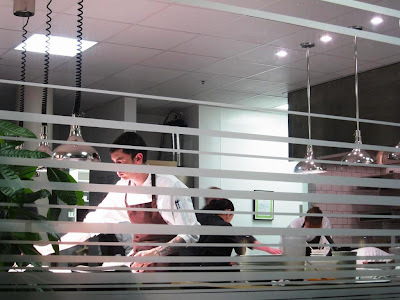 The restaurant itself is very different from any other. As you enter Hawthorne Lane, you notice the large, brightly lit kitchen first. 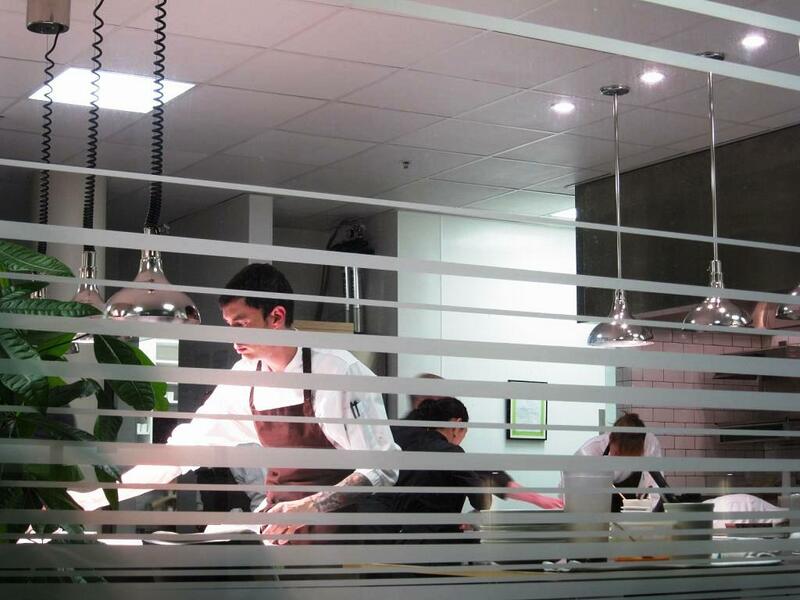 The kitchen faces the road and you can see the chefs going through their chores through the large glass windows. 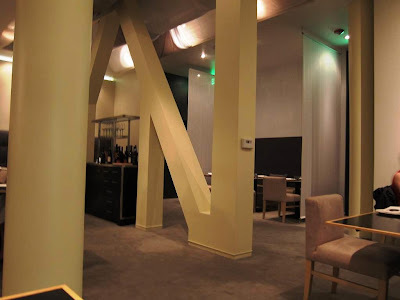 The dining area itself is tucked away behind; in fact, the doorman had to help me locate the entrance! The dining room is stark and minimalist in design with polished dark wood tabletops and no table-cloths. Menus were attached with monogrammed ebony magnets. However, I liked the unique feel of the place. 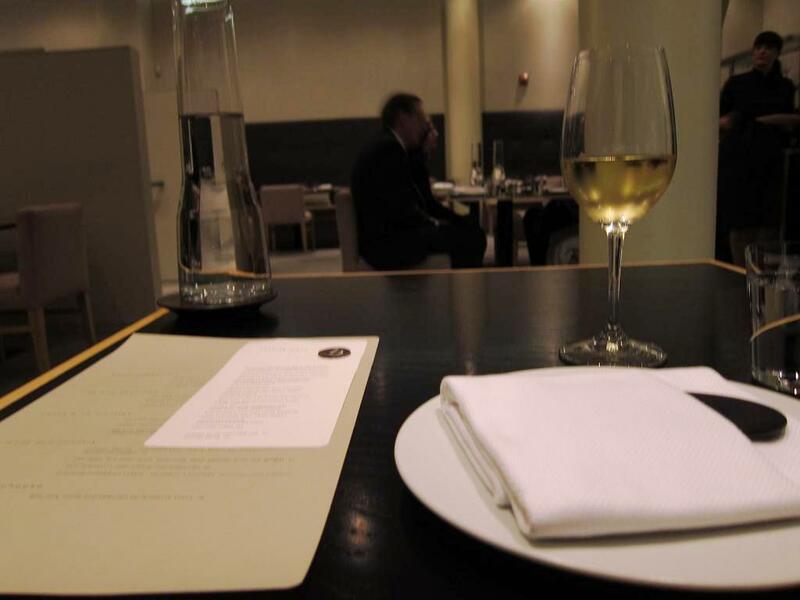 The waitstaff were efficient and friendly and did not attempt to overwhelm. They started me off with an amuse bouche of home-made tofu with crysanthimum and black moss. Very nice! Took me back to my kaiseki meal at the Ritz in Tokyo just the week before. Next came an exquisite presentation of foie gras. 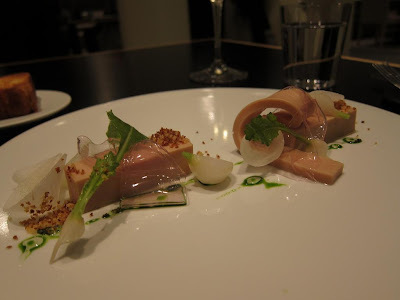 The dish was beautifully presented and the sharpness of the ginger and turnip perfectly complimented the richness of the buttery soft foie gras. 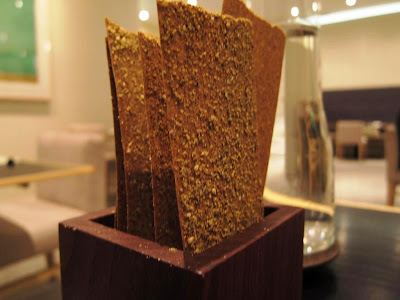 The intensity of the perilla and the crunchy brioche provided a medley of flavors and textures to this starter. 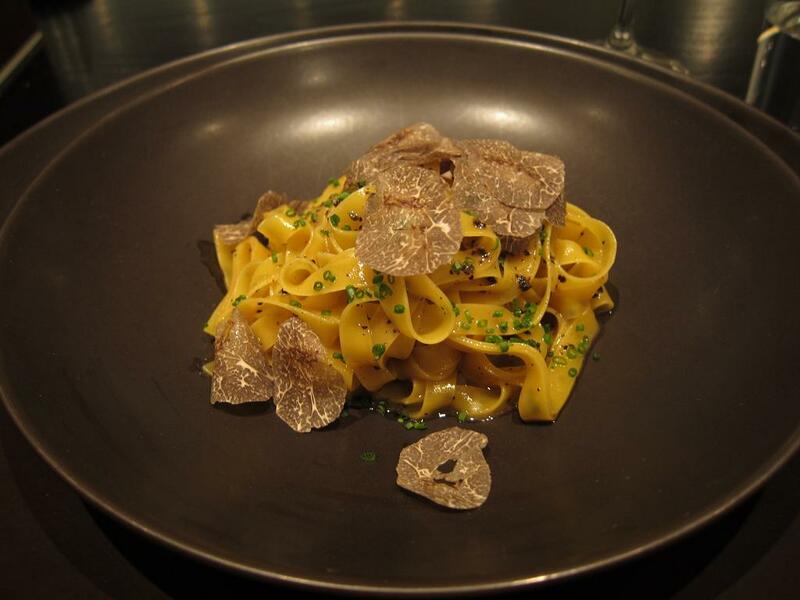 The egg yolk tagliatelle was served with some deal of showmanship. They brought out a lacquered box with French black truffles and delicately shaved off several thin slivers of this earthy luxury onto my pasta. As I ate, I discovered more egg-yolk below the pasta which was cooked in roasted chicken jus and parmesan. I enjoyed the dish, but it was not quite the highlight of this meal. Finally the main course. I had chosen the beef braised for several hours in pear. 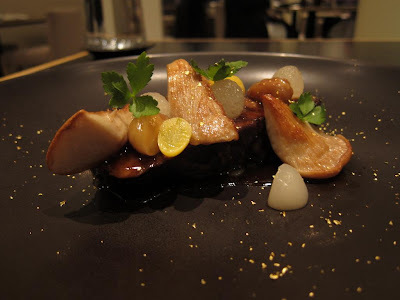 I actually enjoyed the interesting flavors of this dish; the mushrooms and other winter vegetables provided an exciting contrast to the sweet and aromatic taste of the pear juice. I ended this dinner with a dessert of mace ice-cream and chestnut custard. Served with apples and cider, this was clearly a great end to a fantastic dinner. This restaurant is clearly going places; I am surprised it doesn't already have a couple of Michelin stars. 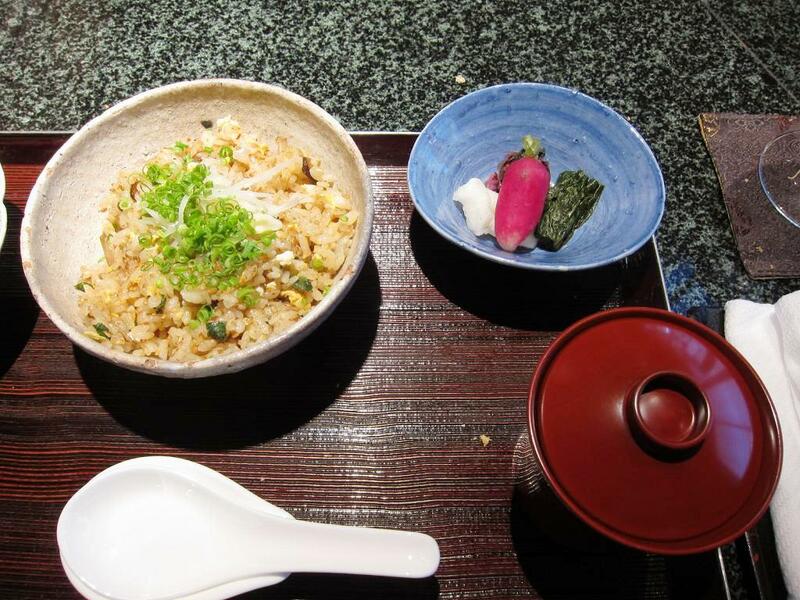 San Francisco has several good dining options, especially in the Union Square-Financial District area where Benu is located. 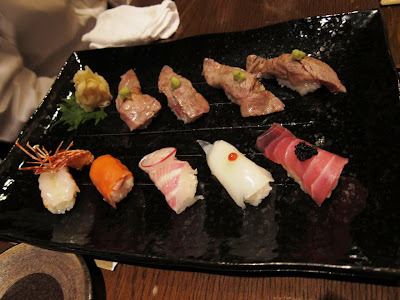 However, after this dinner, Benu scores above some of my other favorites here such as Ame and Fifth Floor. Incidentally, I discovered this restaurant through the Yelp application on my iPad. I was at the W Hotel and this app does a great job of showing restaurants within walking distance sorted by user ratings. 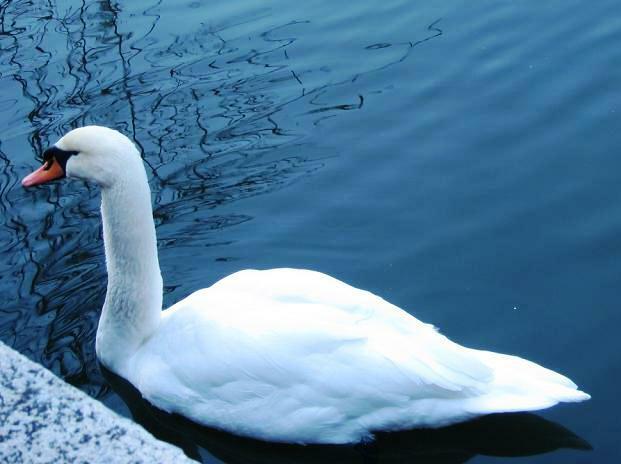 There is a stark beauty in nature during the freezing winters. I had some time during my last day in Tokyo, so I used it to visit the gardens of the Imperial Palace. We left the modern cityspace outside as we entered the old palace area. This was the heart of the Shoguns empire during earlier times. The ramparts of the old fortress are still visible within. 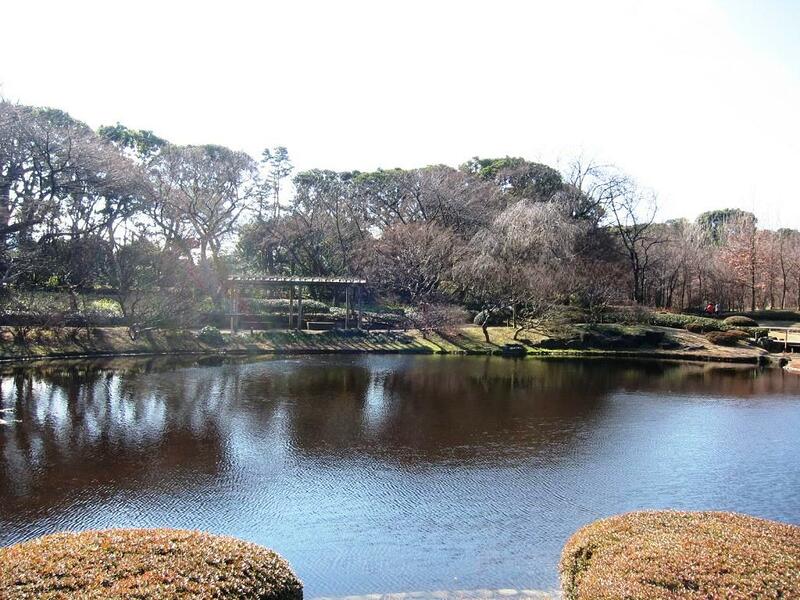 The East Gardens are a wonderful mix of orchards, wild grass, bamboo groves and cherry blossom trees. 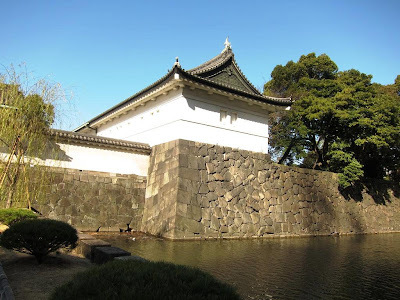 Like most palaces, the entire Imperial Palace is surrounded by high walls surrounded by a moat. There was a serene beauty in the winter morning. I can only imagine how pretty this place is in spring when the thirty different varieties of cherry blossom trees are in full bloom. The winding paths, the water bodies and the wooden bridges add to the magic. Bento boxes are an uniquely Japanese tradition that is ubiquitous in this city. 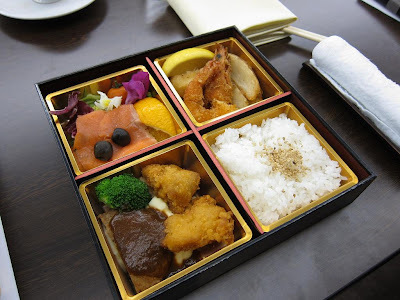 Bento boxes are single-portion lunch boxes with food items tastefully arranged within. 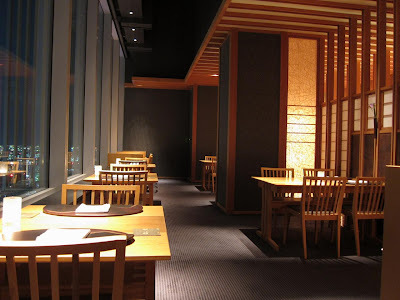 Soba noodles, tempura prawns and a rice set were neatly arranged in mine during working lunches. The best ones are black lacquered, called shokado bento. Apparently, these bento boxes inspired the design of IBM Thinkpads. 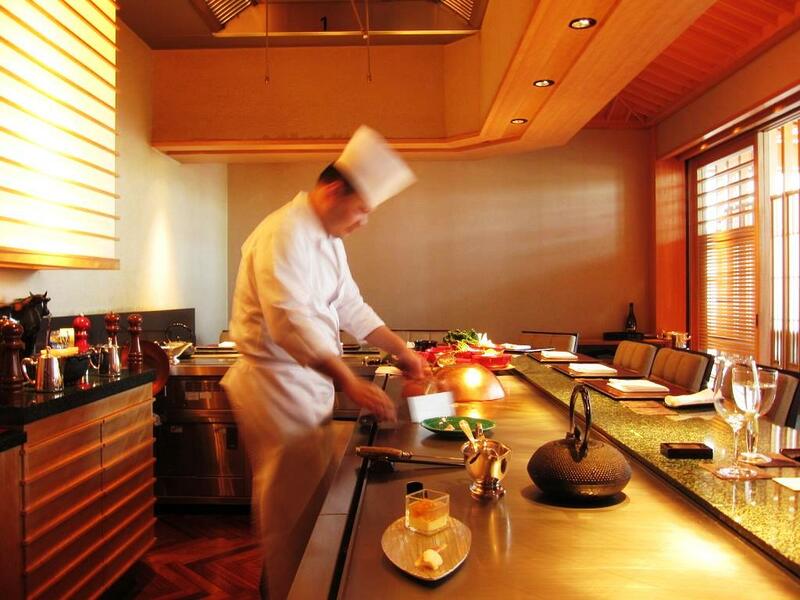 Before I left the wonderful environs of the Ritz, I also had the most awesome Teppanyaki lunch at Kutani. Teppanyaki Chef Junichi Yoshida conjured up a multi-course meal for me as I watched. 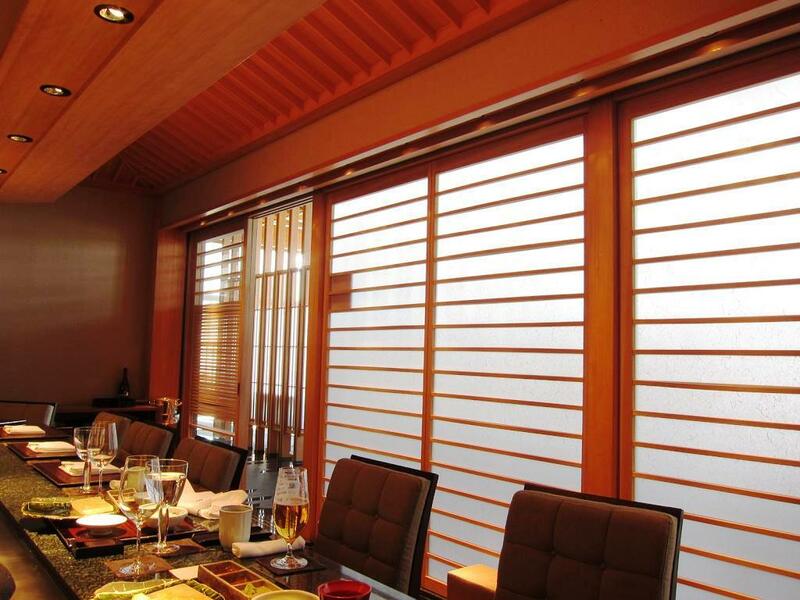 This restaurant-within-a-restaurant is a elegant and intimate affair. 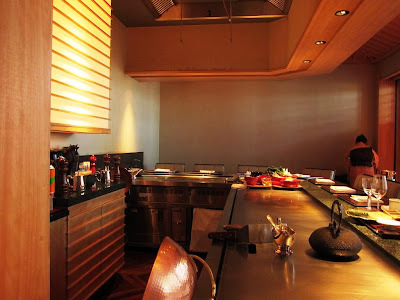 Only 12 seats at the bar as the chef Junichi demonstrates his culinary skills combining the best beef, seafood and about 20 different local vegetables into a lunch experience I will remember for a long time. Chef Yoshida created a fantastic starter of Hokkaido duck on a thick miso sauce and a slice of radish. This was paired with a small dish of crab meat in jelly and some pickles. So much flavor and taste! 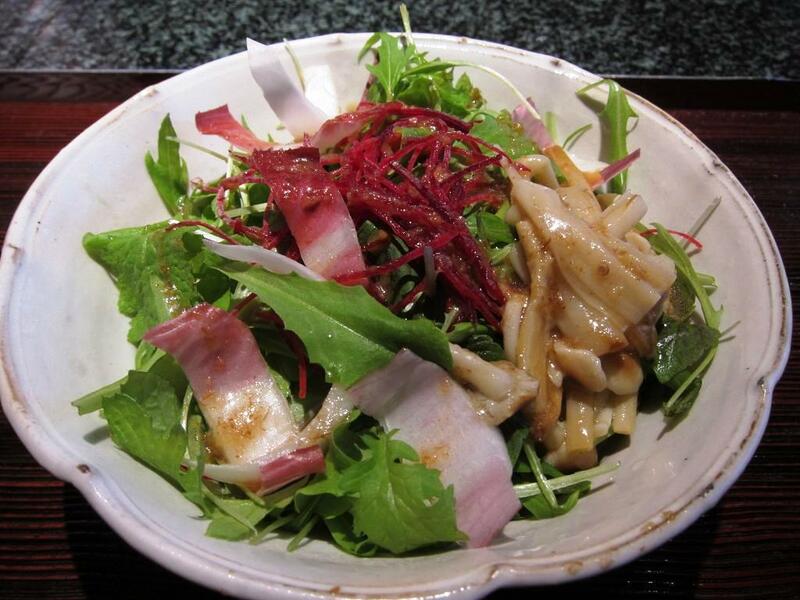 An organic salad followed next with local greens. 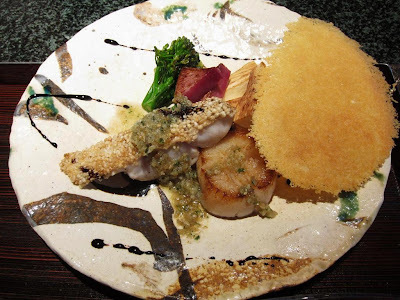 The chef then put a Hokkaido scallop and white fish on the grill right in front of me. It was great fun watching him go through the intricate grilling, seasoning and plating process right in front of me on the counter. I was salivating by the time the dish was ready; it was as good on the palate as it was on the plate. Next came the main course. The fillet of beef tenderloin with Japanese vegetables grilled to perfection. The meat was seasoned with local spices with a very light hand before being sliced and presented to me on a slab of rock salt. I followed the chef's recommendation: put a little wasabi ON the meat before rubbing it on the rocksalt and directing it into my mouth. Heavenly. I have to say this again: Japanese steaks really rock! 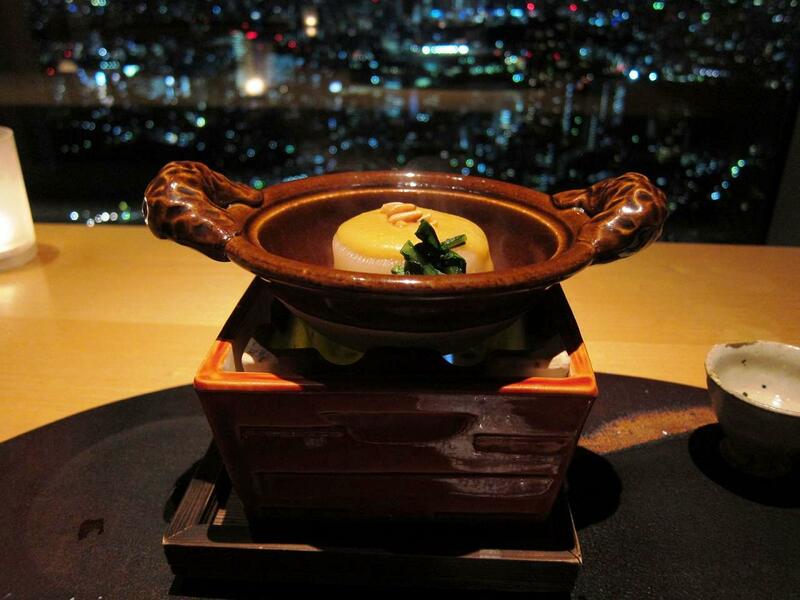 Chef Yoshida has earned the sobrequet of 'beefmaster' in Tokyo and I can see why. By the time, we got to the rice set, I was feeling full. However, the chef made a show of creating even the ordinary garlic rice so very stylishly. So, it was with a very full stomach and a satiated feeling that I walked out of this excellent restaurant. Two major religions co-exist very nicely in Japan: Shinto and Buddhism. 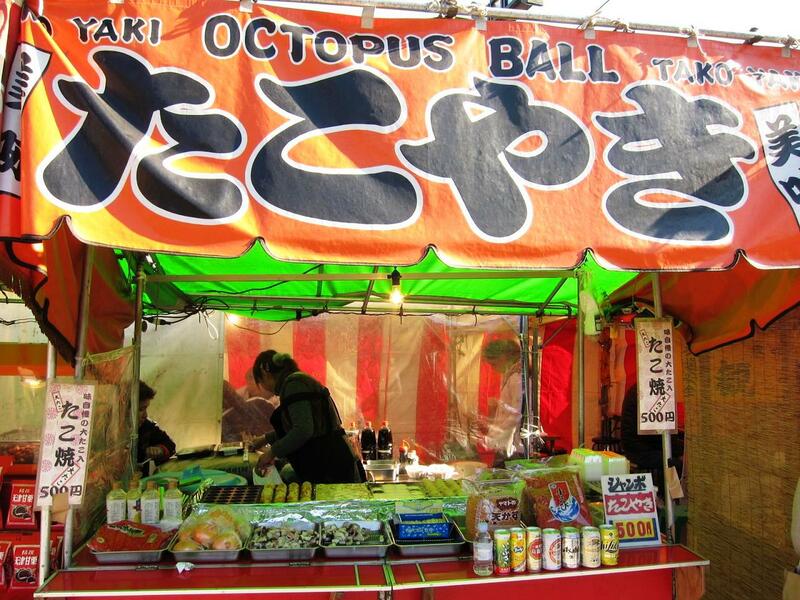 Actually, most people in Japan practice both religions. That may seem like a problem to those from the Abrahamic faiths, however both Shinto and Buddhism do not require professing faith to be a believer. 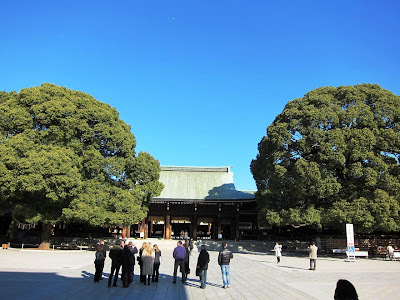 I had an opportunity to visit Meiji Jingu, one of the most popular Shinto shrines in Tokyo. The moment you enter through the large torii gate, you leave the city far behind. The grounds of this shrine are surrounded by large gardens and the most tranquil feeling envelops you immediately. 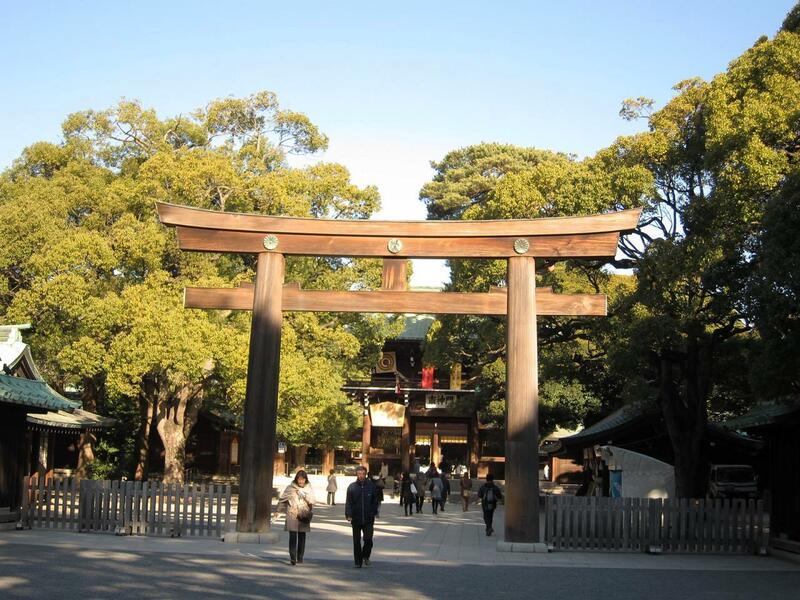 Meiju Jingu is dedicated to deified spirits of Emperor Meiji and his consort Empress Shoken. 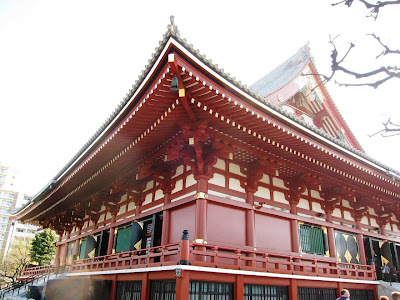 The shrine was built in 1920 and has since been rebuilt after the temple complex was severely damaged during World War II air raids. 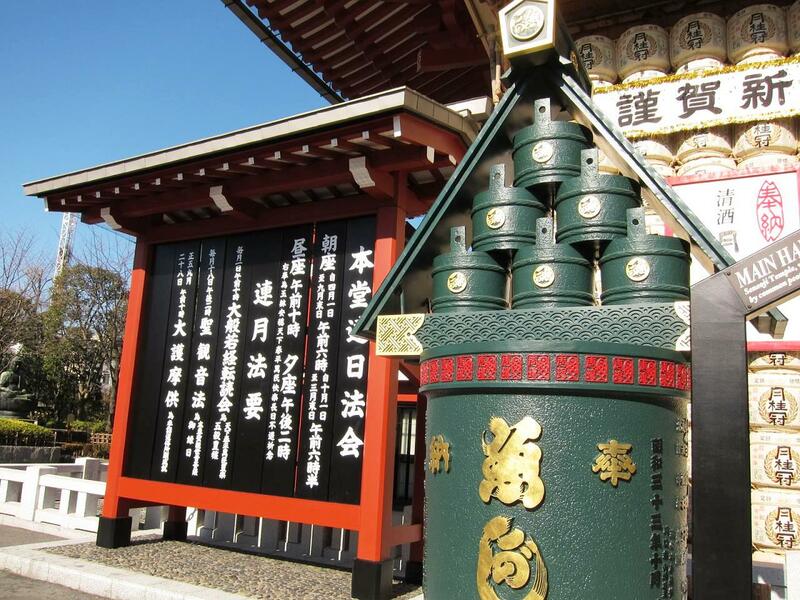 As you walk through the garden complex into the temple, you can see large barrels of sake lining the walkways. 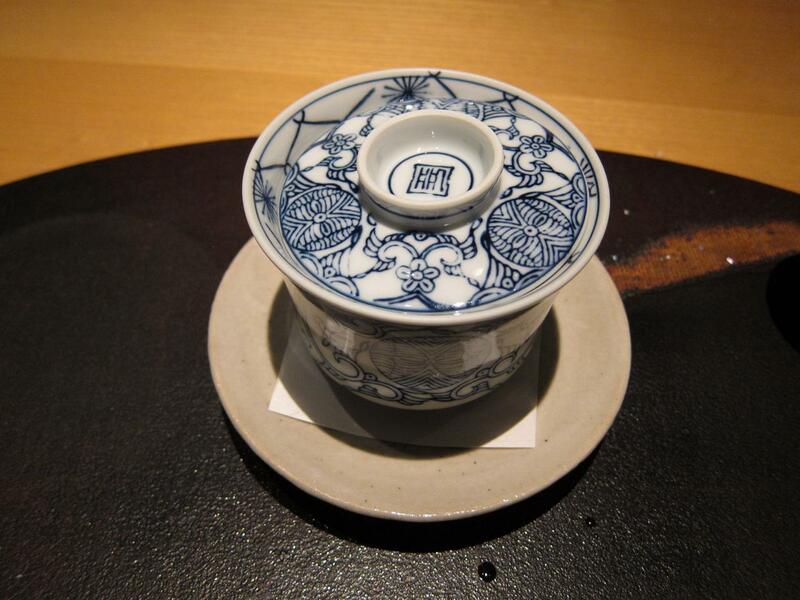 Sake is considered auspicious and sacred by the Japanese, and sake offerings are omnipresent in places of worship here. The temple complex is peaceful, open and airy. 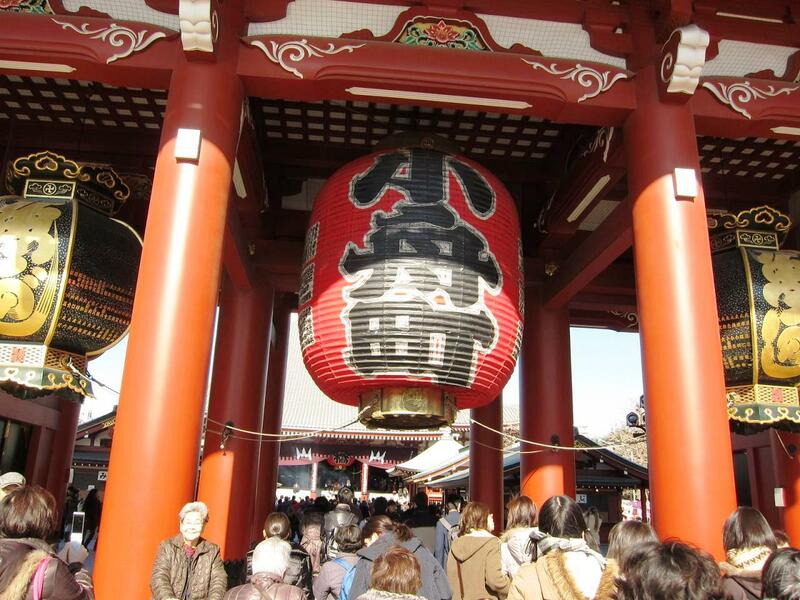 People usually wash their hands briefly before entering the main temple. Large gongs stand next to the central courtyard. 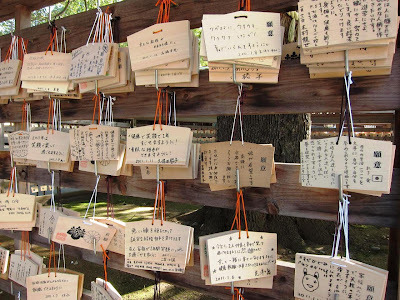 Just outside is a small area where people write prayers on small wooden parchments and hang them up for the spirits. I also visited one of the large Buddhist temples in the capital, the Akasuka Kannon temple. The ambiance here was very different from the Meiji Shrine. Set right in the middle of the busy, historical section of town, the temple complex was crowded with worshippers and tourists. Smoke drifted from hundreds of incense sticks that were placed in the front of the temple by the faithful. Up ahead was the famous Nakamise shopping street, a street lined with small shops selling everything from street food, handicrafts to fashion accessories. Apparently, this shopping street has existed for a few hundred years. 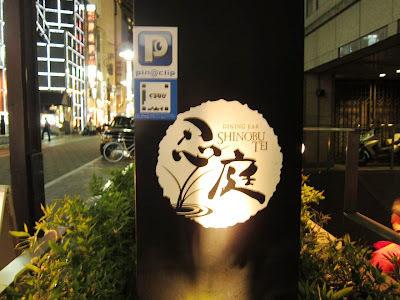 After buying some of the cute little stuff that exemplifies Japan's voracious appetite for all things kawaii, I went back to my hotel. I dined with a few colleagues at one of Tokyo's many izakaya restaurants: Shinobu Tei in Shibuya. 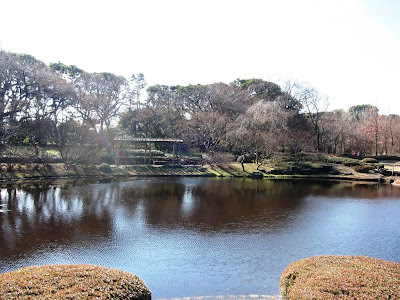 As you walk down stairs into the basement, you enter an area of intricately designed ponds, dried trees and small bridges that add a distinctly Japanese touch to the atmosphere. A large number of private booths provide a place for groups of friends to eat, drink and chat for hours - which is exactly what we did. 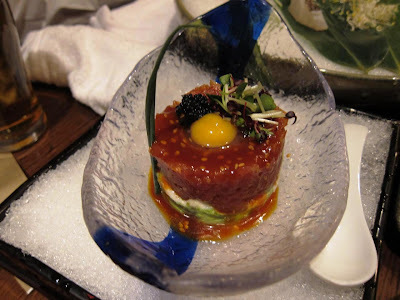 Along with small cups of sake, we shared from numerous small plates: greens, sashimi, sushi, salmon tartare topped with a raw quail egg and rice plates. 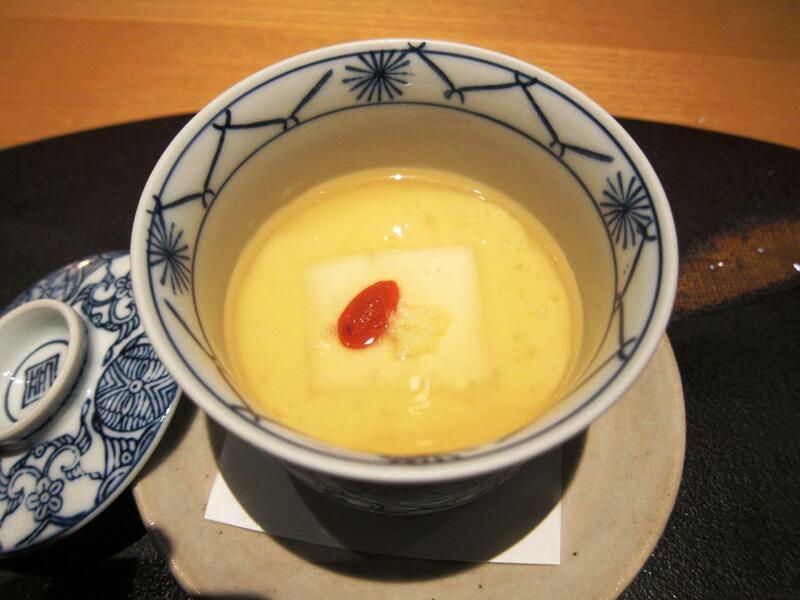 Of course, a hot cup of miso soup too, which I was by now quite addicted to! I also tried the plum wine, which was sweet but nice. 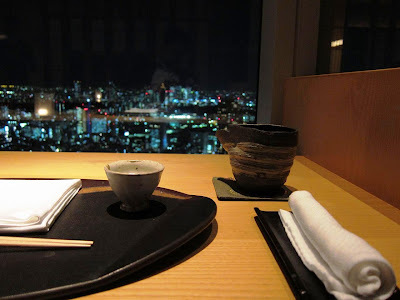 Dining in Tokyo is so much fun. The Japanese are obsessed with food and it shows in the number of restaurants in Tokyo. A variety of eating places dot the lanes of this city. Some do not even advertise their shops and you cannot eat there unless someone introduces you to the owner! 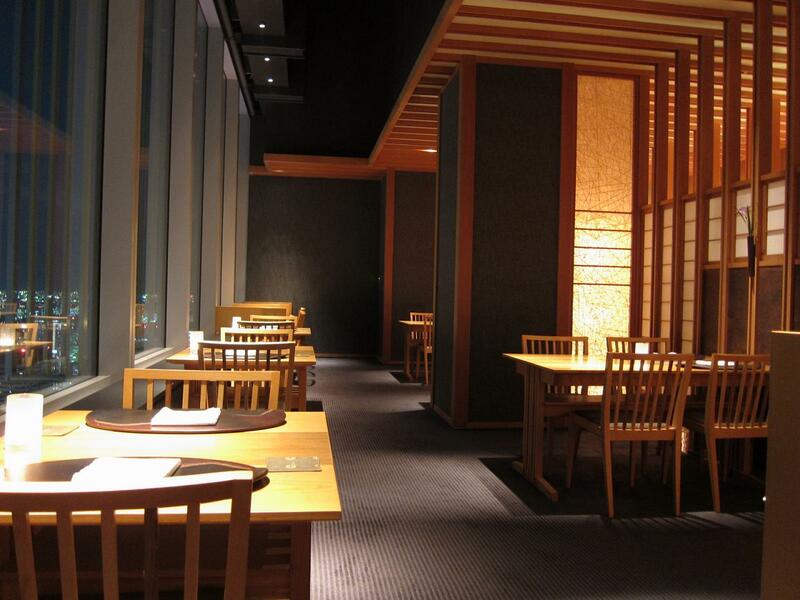 Small, intimate restaurants serve sushi, tempura, tonkatsu and yakitori among other things. For groups of friends, the best places are the many izakayas where you share food and drinks sitting on cushions around a low table. Winter has been severe this year the world over. 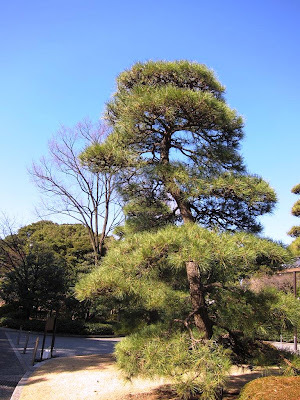 It was about five degrees (C) with a cold wind blowing when I walked out of Narita airport. As I drove over Rainbow Bridge, the red and purple hues of the evening sky reflected off gleaming skyscrapers in the distance and the waterways below - painting the most beautiful panaroma around me. 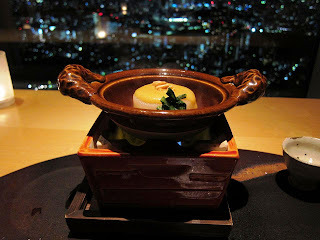 I was whisked into the lobby of the opulent Ritz-Carlton hotel located on the 45th floor of the tallest building in Tokyo. The soaring ceilings of the lobby lounge with its dazzling views of the city below makes this a great place for a quiet drink or an elaborate afternoon tea. Some of the best restaurants in Asia are located within hotels. The Ritz in Tokyo is no exception. 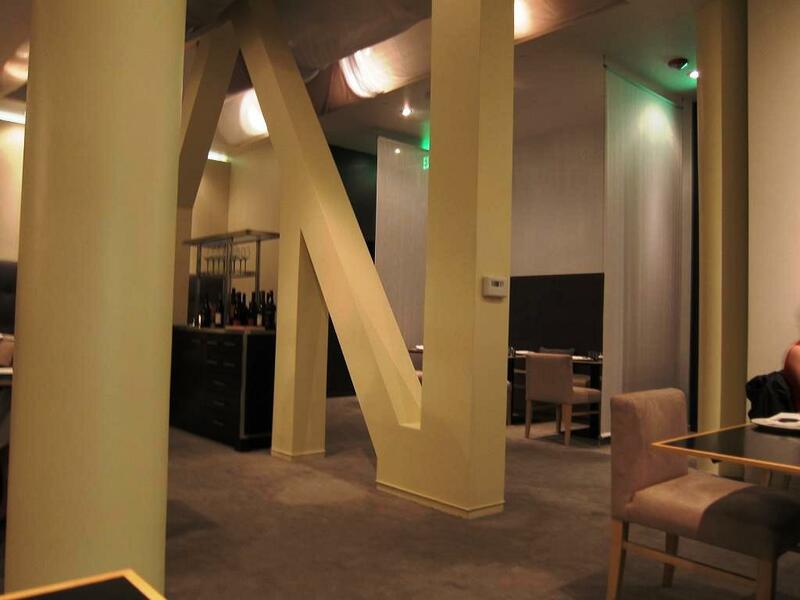 On one end of the cavernous lobby, Azure 45 and Towers Grill serve French and western fare. On the other, the extraordinary Japanese restaurant complex, housing four different eating places under one roof: Michelin-starred Hinokizaka with its traditional Kaiseki cuisine; Arita, the sushi bar; Shimizu, an intimate tempura experience; and Kutani, with its exceptional Teppanyaki fare. 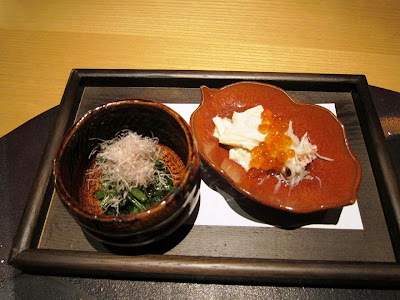 Kaiseki is an elaborate multi-course dining experience. Food is cooked and served in a way that balances the flavors, texture and colors, presented artfully in plates that enhance the seasonal theme of the meal. The plated food looks so beautiful, it almost seems a shame to disturb it! I had chosen the Hokuriku option from the three Kaiseki options in Hinokizaka. Hokyriku is a region located in the north-western part of Japan's main Honshu island and is known for its severe snowfalls. But the meal tonight would celebrate the fresh fish from that region. I chose a glass of sake and sipped on it watching the city of Tokyo ablaze with lights far below me. 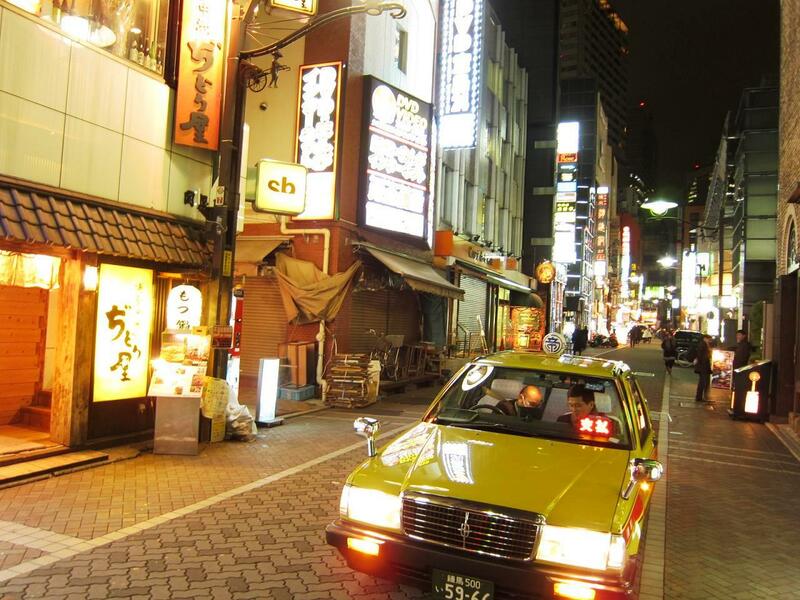 While Tokyo can look pretty unremarkable during the day-time, the brightly lit neon signs and billboards tranforms this city in the late evenings and through the night. 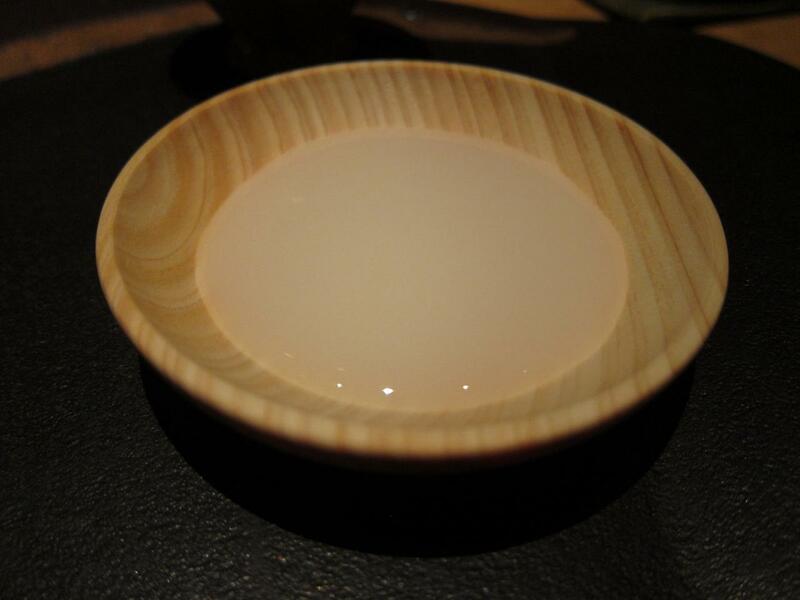 I was presented with a small plate of thick sweet sake as an aperitif. The appetizers followed: greens from the north of the island with fine strands of raddish and a plate of crabmeat topped with salmon roe. Both dishes uniquely different and very nice! 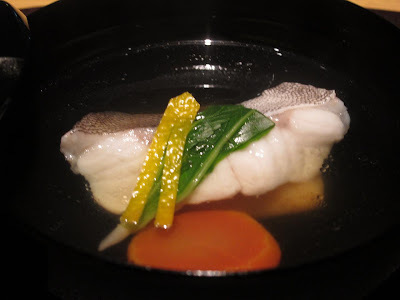 Then came a lidded soup dish with white fish from Hokuriku served on a rice cake and topped with vegetables. The fish was awesome! 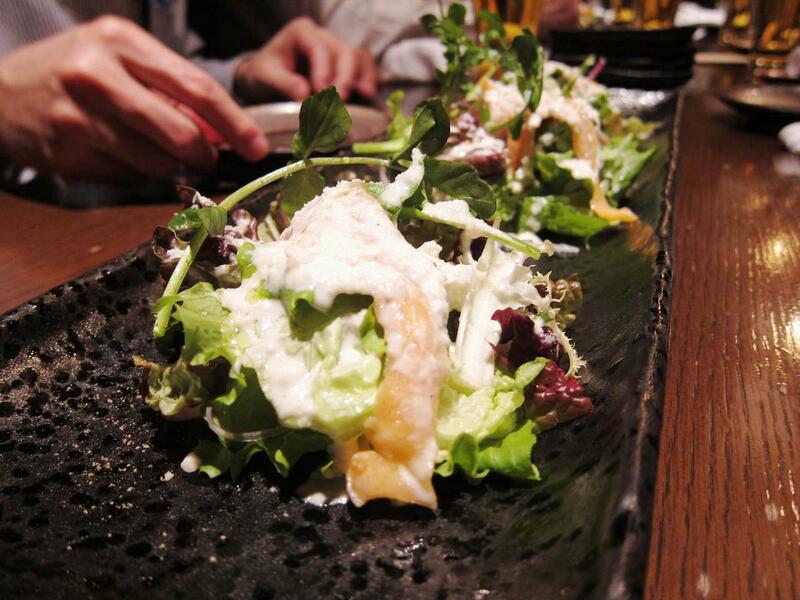 Such freshness and flavor is something that is not easily matched. 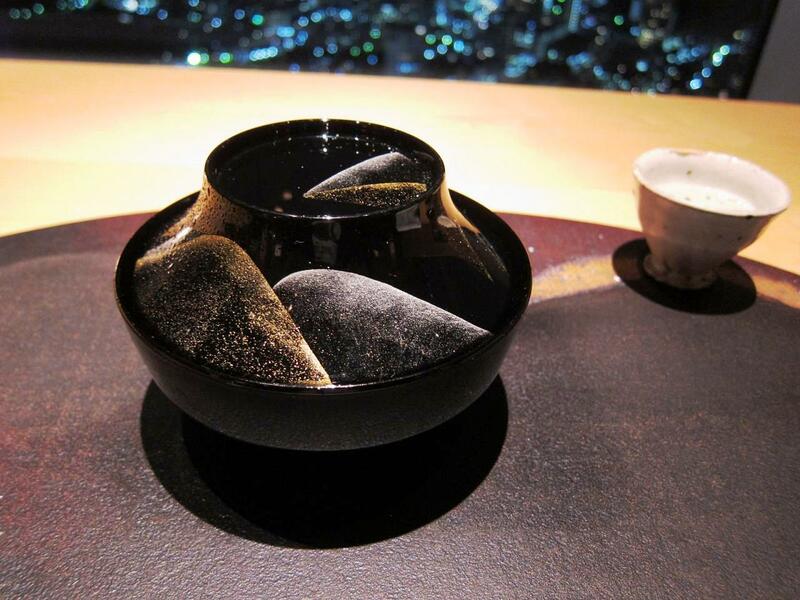 The dishes in which every course was served was unique and enhanced the experience considerably. 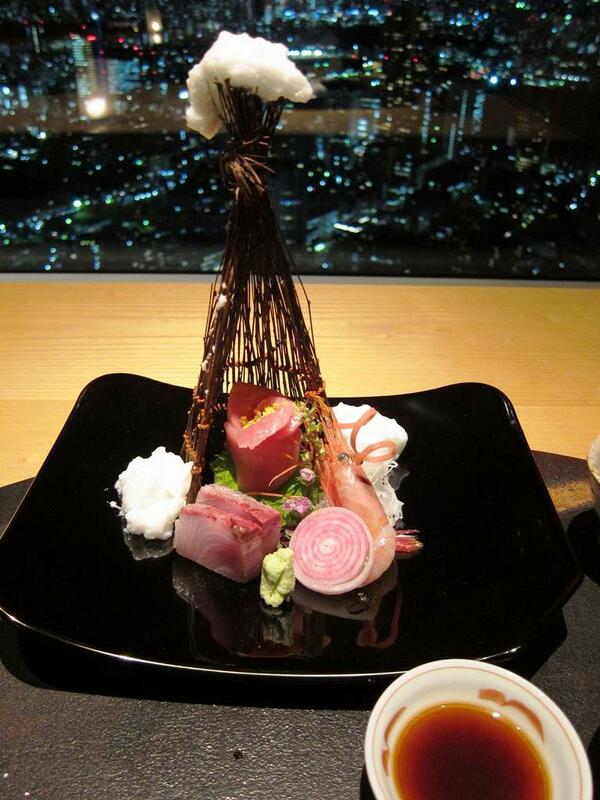 The sashimi platter was as delectible as it was arty in its presentation. 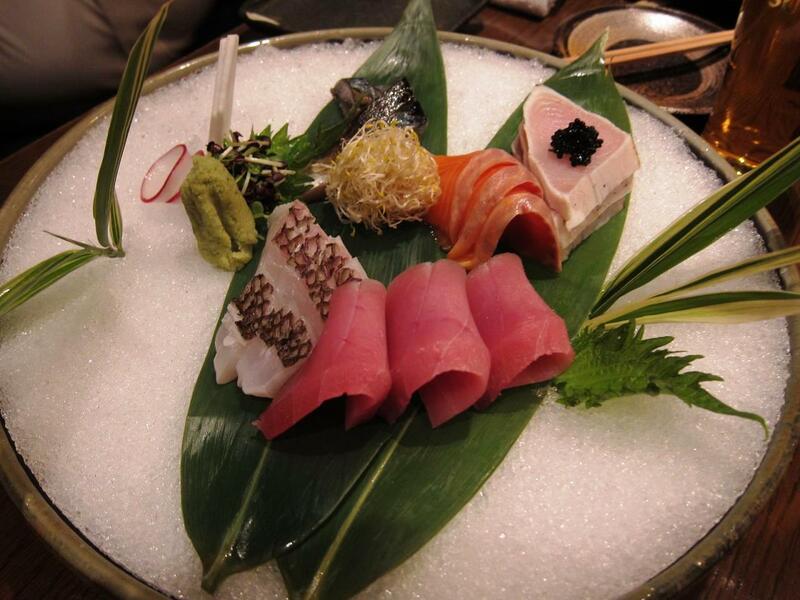 Fatty salmon, shrimp and mackarel was served with two different dips: a special soy and a sashimi sauce. While I have seen people mix soy sauce with wasabi in the bowl as a dipping sauce for sushi and sashmi, Japanese foodies recommended a different procedure: put a little wasabi on the fish and then dip into the sauce before putting it in your mouth. 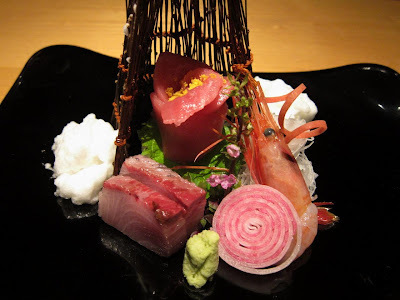 I also discovered several alternatives to wasabi in Japan that enhance the flavors of sashimi. 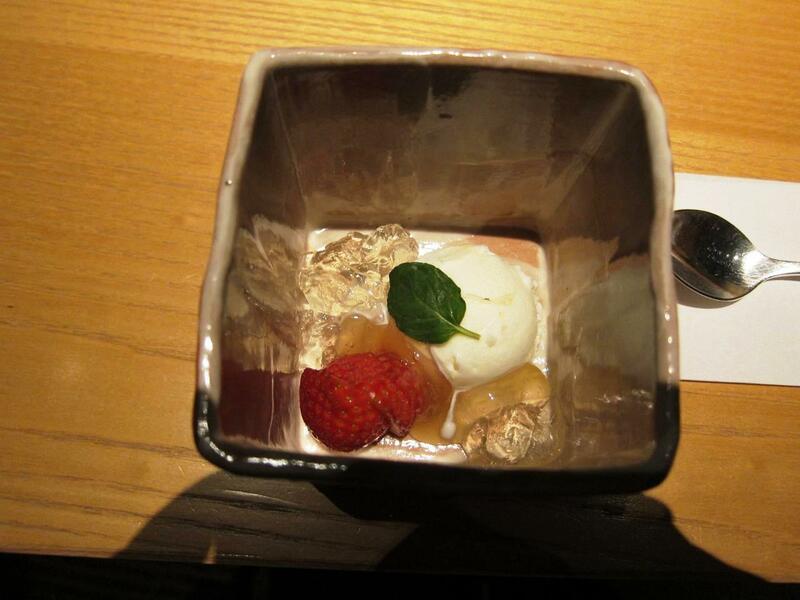 Then came a pretty little dish that looked like a dessert. 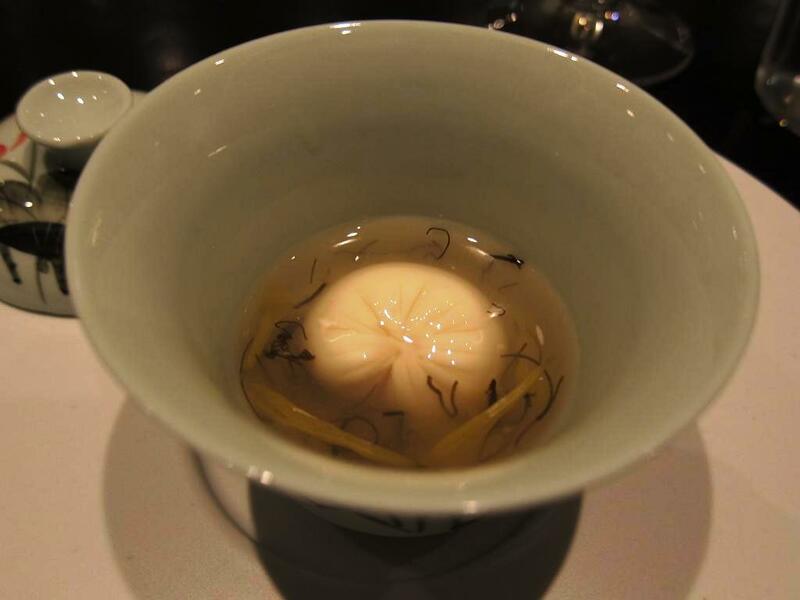 The waiter added some soup to it making it bubble and steam. The dish was amazing: home made tofu in melted cheese. 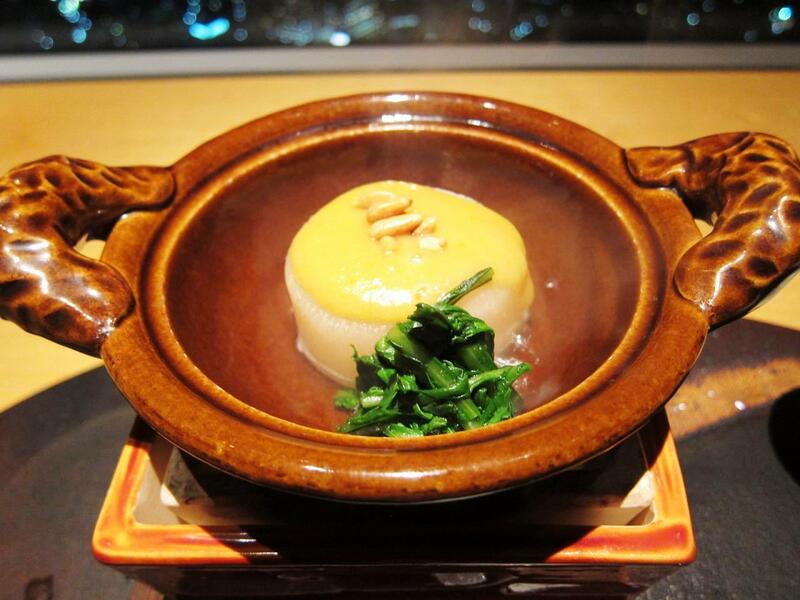 One of things that stands out in Japanese cuisine is how much care is taken to preserve the natural flavors of ingredients. With so little addition of fat, salt and sugar, it is no wonder they are naturally skinny. 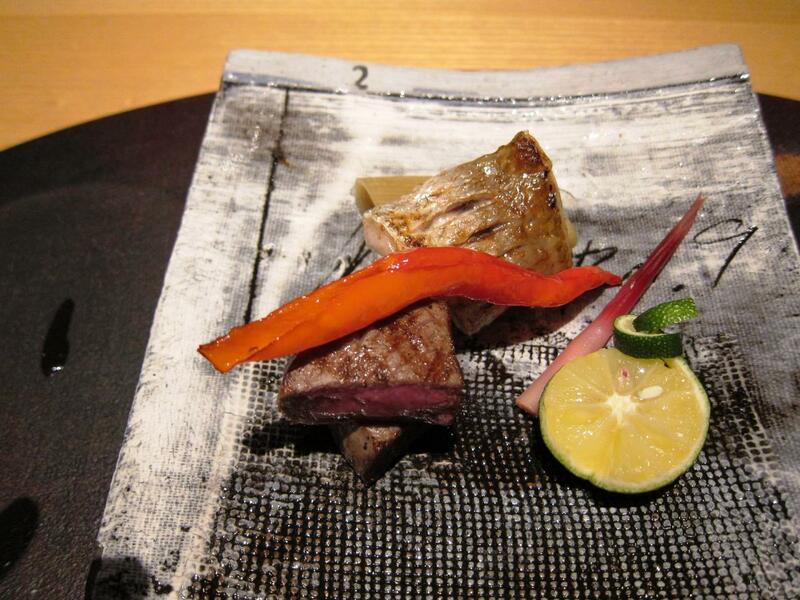 Next came the prime steak of Japanese steak and fried fish. Excellent stuff! Very flavorful and melt-in-the-mouth goodness. 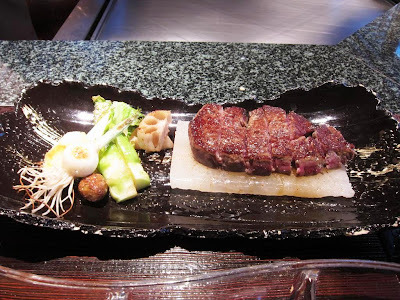 I am in love with Japanese steak now - the quality of the meat and the seasoning were completely divine. The next course of Japanese radish in sesame sauce simmering over an open fire on the table was very interesting. Reminded me of a dish my mom used to serve during childhood days of the freshest raddish boiled and served with a simple topping of mustard oil and sea salt. Then followed a refresher of seaweed and some kind of tofu with cucumber in a jell served in a hollowed out orange. 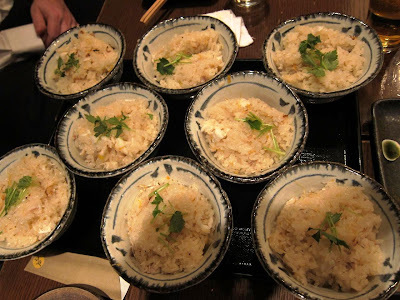 Finally, the rice set: an essential part of Japanese dinners. 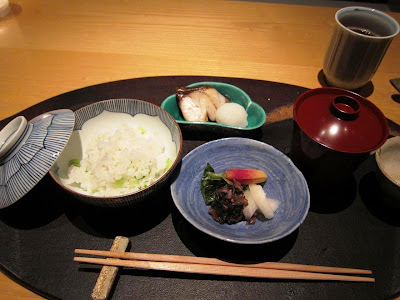 Served with Japanese pickles, a lightly fried mackarel and finely grated raddish with sticky rice and miso soup. They did add a dessert at the end that seemed more for Western palates: mandarin ice-cream, strawberries and jelly topped with a really strong and sticky syrup. 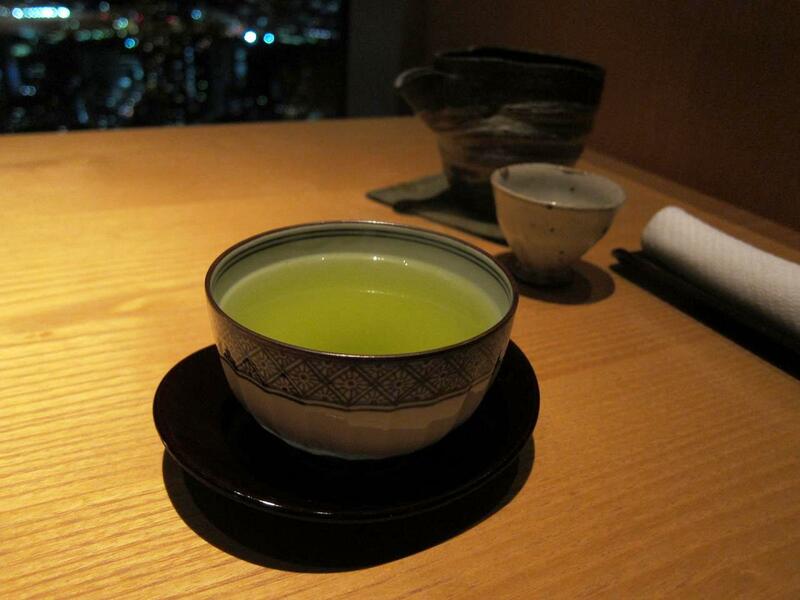 I brought this fine meal to an end by finishing the cup of Japanese green tea. Oh what a meal! By the time I got up, I had spent almost three hours at the table.